If you haven’t been to 13 Ice Cream, you’ve been missing out on some of the most unique ice cream flavors you’ll ever find. In addition to the usual strawberry, pistachio and cookies and cream — all fresh-made, by the way — you might find broccoli, kale, avocado, marigold, saltine and champagne flavored ice creams and ice cream bars. You never know what flavor owner Julian Vega will think up next. 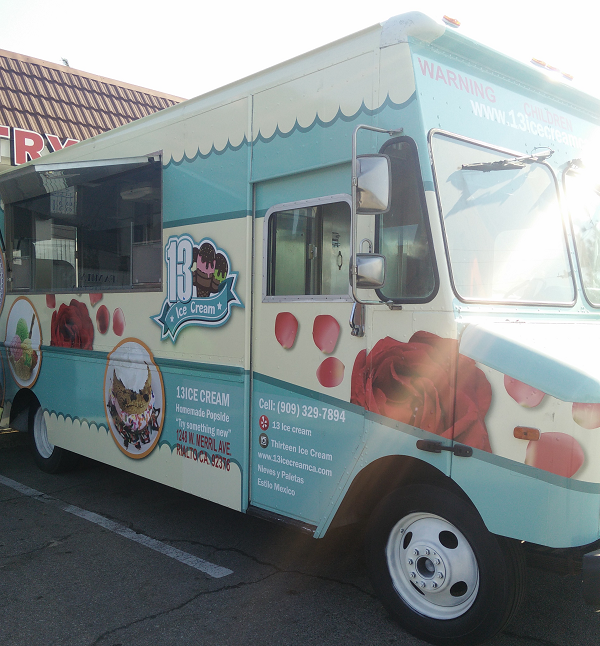 The truck will make its inaugural stop from 5 to 10 p.m. tonight (July 30) at the city of Fontana’s Sunset on Sierra festival. The event will take place along Sierra Avenue, between Seville Avenue and Orange Way. Vega promises to debut a special flavor at the event. Even I don’t know what it will be. By my count, this will be only the fifth business operating a food truck in the county. If you can’t wait for the next truck appearance, you can always visit the shop at 17337 Arrow Blvd., Suite 100. This entry was posted in Fontana by John Plessel. Bookmark the permalink.